Generalized morphea is a subtype of localized scleroderma, which lacks systemic manifestations and displays widespread, multiple, well-circumscribed, indurated plaques. We represent a 46-year-old woman with generalized morphea. More than 3 years ago she developed multiple, nonpruritic plaques symmetrically on the trunk and extremities. The patient’s clinical history, laboratory analysis and histopathologic examination were consistent with generalized morphea, a rare subtype of localized scleroderma. Key words: localized scleroderma, morphea, generalized morphea. 1. 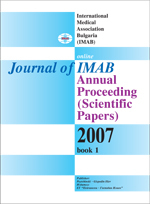 Jemal A, Tiwari RC, Murray T et all, Cancer Statistics, 2004. CA Cancer J Clin 2004;54:8–29. 2. Glimelius B, Hofman K, Graf W at all, Quality of life during chemotherapy in patients with symptomatic advanced colorectal cancer. The Nordic Gastrointestinal Tumour Adjuvant Therapy Group. Cancer 1994; 73: 556–562. 3. Machover D. A comprehensive review of 5-fluorouracil and leucovorin in patients with metastatic colorectal cancer. Cancer 1997; 80: 1179–1187. 4. Meta-analysis Group in Cancer. Efficacy of IV continuous infusion of fluorouracil compared with bolus administration in advanced colorectal cancer. J Clin Oncol 1998; 16: 301–308.